There are many things to consider when purchasing a new mattress. You want to be sure to choose a mattress that is both comfortable and affordable. Some people approach mattress buying with other must-haves, including materials to keep you cool in summer and warm in winter, and support that is specific to an individual’s needs regarding back, neck, or joint pain. What many people don’t take time to think about, however, are the materials that make up the mattress. Organic mattresses and traditional mattresses offer many varieties of firmness and support, but the difference is in the materials. This guide will help you make an informed decision about the materials used to make up your mattress and offers information on their purpose. As always, the best way to gather information is to test out a variety of organic and traditional mattresses in a mattress showroom before making a final decision. When latex is 100% natural, it is made from the sap emitted by rubber trees and does not include any additives. An organic latex mattress will include at least 95% rubber, but many are actually comprised of a combination of latex and other fillers. Wool is a great addition to an organic mattress and perfect for a sleeper who tends to run hot. It may seem counterintuitive, but organic wool actually cools the body as it sleeps. In fact, wool is comprised of air pockets that allow for increased circulation within the mattress. Many organic mattresses contain a layer of wool but be aware that mattresses made up primarily of wool will not last very long as the material is not as durable as other organic materials. Organic cotton is the main ingredient of an organic mattress. Whether it’s used as filler or as a casing around the interior materials, cotton is essential to producing a firm or medium-firm mattress. Foam is a very popular option in traditional mattresses these days, particularly memory foam. Memory foam is made in part with polyurethane, which is known to contribute to off-gassing. Off-gassing is the smell the memory foam mattress gives off after it is unwrapped and the reason why many people choose to let it air out for a few days before sleeping on it. Memory foam is soft and molds to the body, but may not be supportive enough for some people. Blended foam is another option and is a mixture of synthetic and natural materials. It may be a good compromise for someone seeking the softness of a foam mattress but who wishes to sleep on a mattress made in part with organic materials. Finally, gel-infused foam is a popular option for sleepers who tend to sweat during the night. The gel acts as a cooling agent to bring down the temperature of the mattress, however, it may still be too hot for some people. Innerspring mattresses contain metal coils deep within it to provide comfort and support. Many organic mattresses have innerspring support as well. The difference is traditional innerspring mattresses also contain latex, wool or other materials to wrap around the innersprings, while organic mattresses use natural and organic versions of those same materials. Typically, the reason why many people choose an organic mattress over a traditional mattress is to ensure that they are sleeping on a chemical-free bed. Organic mattresses are usually naturally hypoallergenic, making them ideal for people who suffer from allergies. Additionally, the materials used in organic mattresses are usually sustainably farmed and manufactured, which is an environmental factor important to many people. Many organic mattresses are also naturally fire resistant, although some organic mattresses do contain the same flame retardants as traditional mattresses. Some people are allergic to the components of traditional beds and can be irritated by glues or other materials in them. Both organic and traditional mattresses are competitively priced, meaning it is possible to purchase an organic mattress that is less expensive than a traditional one. 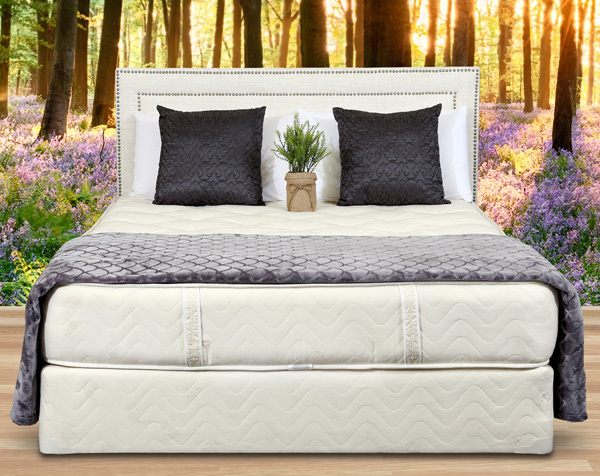 Gardner Mattress carries organic and traditional beds at a variety of competitive price points; there is definitely something for every budget to meet a shopper’s specific sleep needs. Contact Gardner Mattress or visit our showroom to speak with our knowledgeable staff. Try out our organic and traditional mattresses in-store today.